Number of showers this unit can handle, depending on ground water temperature. The TK-110U-E supplies hot water to domestic hot water systems and can be used with water storage tanks, recirculation systems, and/or combined domestic & heating applications. This model is intended for Outdoor installation, no venting is required. Please check the Product Manual for information on proper installation. The 9007674005 Recess Box completely houses the tankless hot water unit and allows it to be completely recessed into a wall for a smooth, almost seamless look. It is just over 14 inches wide so it easily fits in-between the studs. The 9007670005 Pipe Cover protects the plumbing pipes to the water heater from unexpected adjustments. This pipe cover is fixed to the bottom of the water heater, which hides the plumbing and improves the visual aspects of the whole installation for the water heater. Find a distributor or service provider in your area. Register your product online and you can benefit from our full warranty and support. 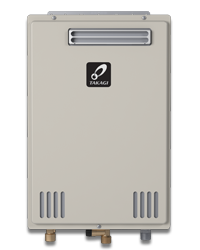 *Takagi tankless water heaters provide endless hot water when sized appropriately for your home's needs.